The cool thing about having no class on Friday is that my friends and I can all go do cool things together. The cool thing about having no class on Thursday while my friends do, is that I can go do cool things that interest me (but maybe not them). So one fine Thursday afternoon, I headed down to the Plaza de 25 de Mayo to watch the Mothers of the Disappeared do their walk around the plaza. The history behind this protest dates back to the seventies during the dirty war. The military dictatorship would just take folks who protested their government and people would never see them again. The organization (Las Madres de los Desaparecidos has turned into a huge human rights organization since then) says that about 30,000 people are still missing. So, in the seventies, each Thursday the mothers of the people who had disappeared would put white scarves on their heads and walk in a circle around the plaza, calling out protest chants. Today the mothers keep doing that walk, over thirty years later, as they continue protesting the lack of information about their missing children. Each of the large cities we’ve been to has a main plaza and on the ground of that plaza are stones designed to look like the scarves they’re wearing because these are countrywide protests. I arrived a little late so they were already walking when I got there, and because these women are all getting quite old they only did a few circuits, behind them walked supporters of the organization, adding their voices to the chants. Afterwards the main women gave a speech about the need to continue searching for their children; but she ended it on a very happy note saying, “I end this day with hugs to all of you and to our children. So that we may enjoy [life? ], yes enjoy it and be happy.” When I first arrived in Buenos Aires, I couldn’t understand people speaking on microphones or the daily conversations around me but now, two months later, I’m amazed at how much I realize I actually can understand–like this woman’s speech (except life, obviously). And, in addition to her speech, I was able to understand one of their chants: El pueblo las abraza/las madres de la plaza (The city hugs the mothers of the plaza). 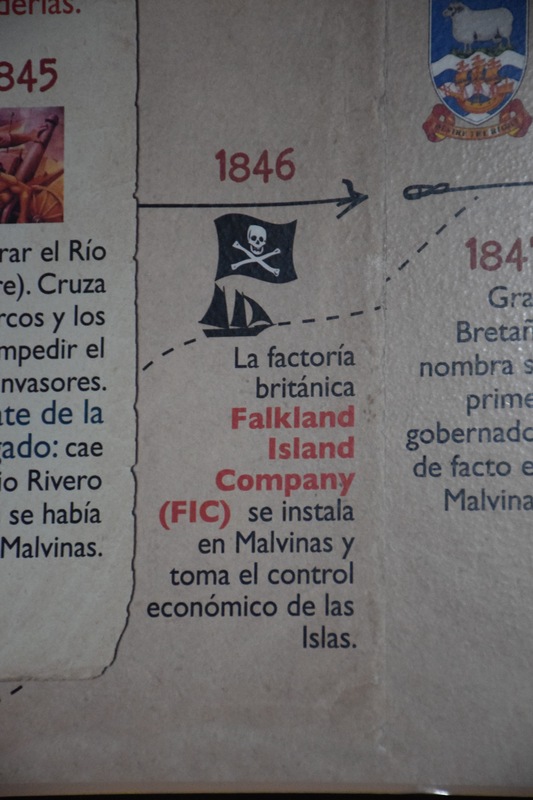 The British company Falkland Island Company (FIC), moves to Las Malvinas and takes economic control of the islands. …but this isn’t it. 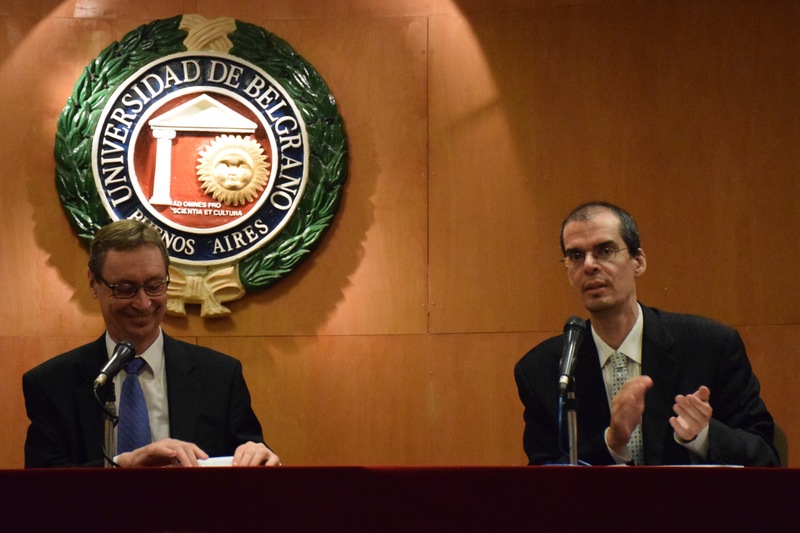 As part of the Ambassadors Cycle at my university here, they invited the German Ambassador to come and chat with students about Germany’s relations with Latin American countries and it’s vision for that relationship, with a focus on Argentina. Deciding this would be an important event to attend, I headed down to the conference room it was held in, naively thinking that it might be in English. Obviously it was in Spanish. So I spent a lovely hour listening to the German Ambassador chat about latin american affairs from a German’s perspective, furiously jotting down notes in spanglish as I feverishly switched between translating and just understanding what the Ambassador had to say. It ended up being very interesting as he reported on expecting Argentina to stay a close ally of Germany in the UN, and, interestingly, wanted to see one of the G-5 (Germany, Argentina, Brazil and two others, I don’t remember, it’s in my notes) to become a permanent seat on the Security Council. There was a Q&A opportunity at the end, but my questions were slightly more complicated than my Spanish could handle at the required pace, so I enjoyed the questions of the other students. The Ambassador is rocking the blue tie. If you remember a few blogs back, I talked about this awesome multicultural festival with all of the different communities in Buenos Aires coming together for a day of good food, shows and a beauty pageant style competition to select the new Queen of the Communities. 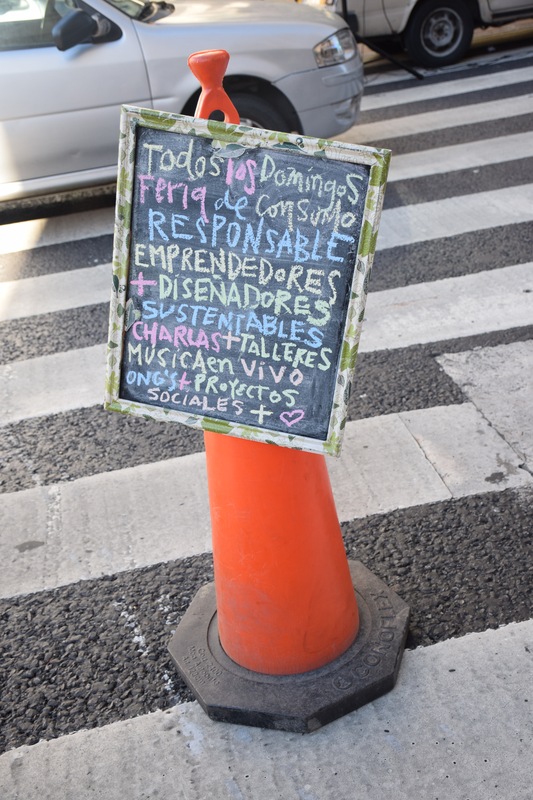 Well, to continue this lovely celebration of culture, Buenos Aires has sporadically selected Sundays throughout the year for each community to take over the whole street, sell food, and perform on the big stage. The first one was the Syrian culture festival, which my friends were happy to attend with me; and I was happy to wander around in awe, eating shawarma, reminiscing on my times in Israel, the West Bank and Jordan, listening to the familiar sounds of Arabic in the street, and seeing dabkeh dancing on the stage. 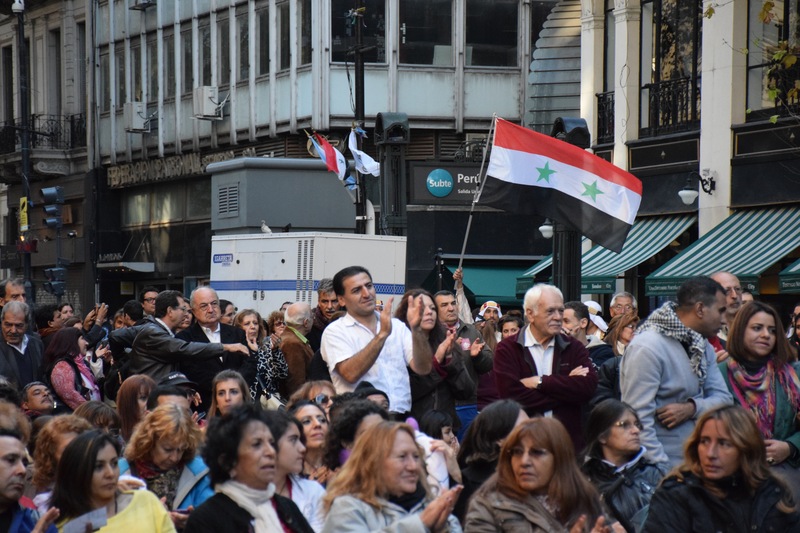 Seeing the Syrian flag waving gave me deja vu as I remembered the last time I saw it waving was while I was standing at the top of the Golan Heights, looking out into Syria. But the best part of the day came near the end, when the whole crowd began dabkeh dancing (it’s sort of like Arab line dancing, but really you should just youtube it). After watching a few rounds, I finally got up the courage to jump in myself, joining hands with the nearest circle and following the footsteps of the dancing as we all headed around the circle. I haven’t dabkeh danced since I was in Israel so this was so much fun for me, and a little bizarre. I never expected to find myself dabkeh dancing in Buenos Aires! Back to the other Las Malvinas Museum! So I took advantage of the weekend and brought a friend with me to attempt to find this other museum I’d read about. When we got to the address of the museum, we found ourselves standing outside of a huge gated area with signs telling us that this area was beginning to be turned into a museum. We entered through the main gate and began to wander through the dilapidated buildings, half searching for the museum, half enjoying the desolation and climbing into the watch towers. Many of the buildings had plaques on them explaining that they used to be used for recreation or as a mechanic or arms shop. The further we wandered into the complex the clearer the picture became and we realized that we were wandering around an old secret detention/torture center from the military rule that was disguised as a naval academy (or just serving a dual purpose). 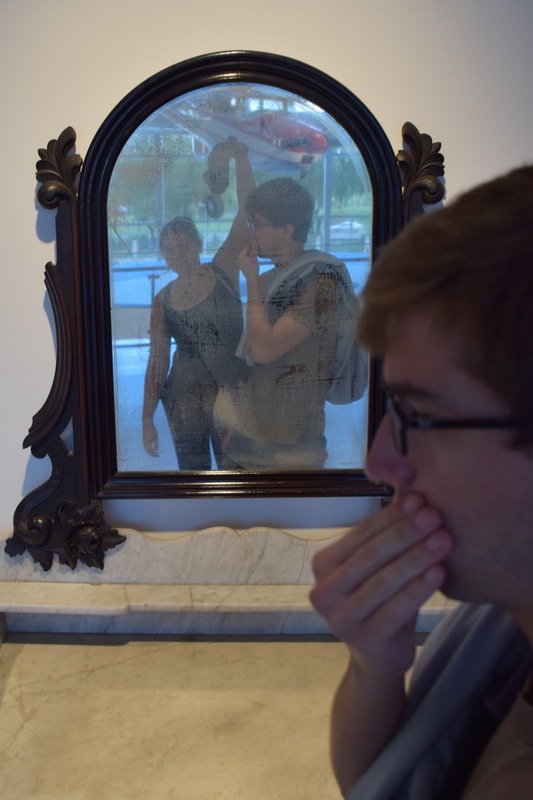 Eventually we found the museum, but we felt incredibly torn because we weren’t done wandering around, but we also really wanted to see the museum. So we decided to go into the museum, knowing that we could go back out to the detention center when we were finished inside. Unfortunately, we ran out of time because the museum was actually fascinating. It had many exhibits that combined paintings, plaques and videos to provide complete pictures about different time periods. Through different exhibits we began to explore the connection between the Dirty War and the Las Malvinas War. This museum too, had a section on the importance of the environment of the islands with a smaller display showing potential oil deposits, the majority of the exhibit was dedicated to the wildlife. This museum began with a timeline and I read it slowly, trying to find comparisons between this timeline and the other I’d viewed. There was a certain lack of pirate flags on this timeline, however the propaganda was still there in the wording of the events and the constant referral to the islands as “Our Malvinas.” We tried to see the whole museum and failed so we’ll be returning to the complex to give it another go, but I did get this rather cool picture in one of the armoires that they had on display! The hippodrome in Buenos Aires (hipódromo in Spanish), is rather famous among the residents who will hurry to encourage us to visit it at least once during our stay in Buenos Aires. 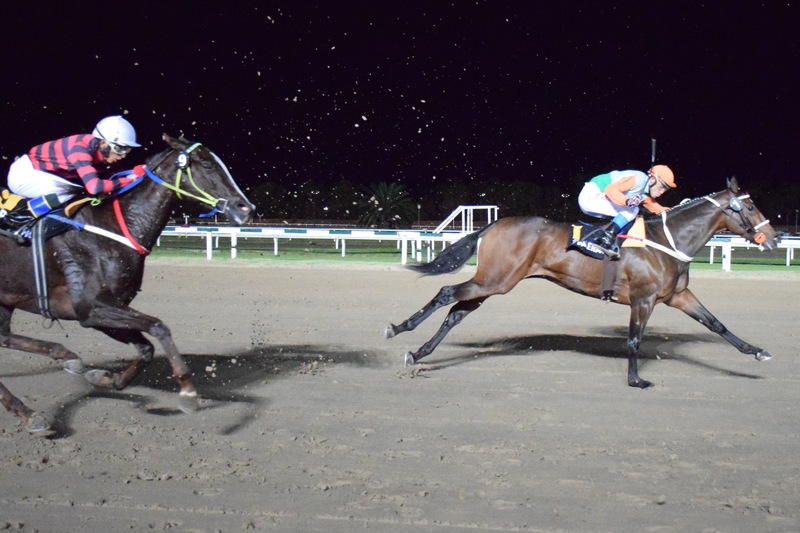 In addition to horse races, the hippodrome also has nightly dinner shows and a small casino! There were some huge races there the other week, I guess the horses were qualifying for an international competition? Anyways, it was free to go that day so we headed out to the races. I’ll admit that “The Ascot Gavotte” was playing in my head for the majority of our time there. I did manage to take some excellent pictures but only after I took matters into my own hands as far as camera settings go. The horses were running so fast that the sport mode was unable to get any good pictures of them. As I’ve mentioned in the past, the San Telmo Feria occurs every Sunday downtown. Fun fact: there’s also a Green Feria that occurs a block and a half away that we stumbled upon. It was tiny, but it had some very cool products. Lots of plant holders made out of bottles, recyclable and reusable bags and back packs and even a bike that you could ride on for twenty minutes to power a blender to make yourself a smoothie. #datcitylyfe: There’s this rather universal stereotype of folks from the US that they’re always very loud. And hanging out in Buenos Aires you can sort of see where this comes from; in our group at least, we’re pretty darn noisy. When my friends came over to work on a project one day we didn’t wake up my host sister and the whole family was shocked that we had stayed so quiet. This is a rather cultural thing however, and I didn’t realize it until we were out with our group and our program director commented on how we seemed to be so much louder outside. At that point we explained that as children we’d been taught that we could be as loud as we wanted outside, that outside was the place to make noise and this was explained through the concept of an “indoor voice” and an “outdoor voice.” Our program director had no idea what we were talking about — fun fact: Argentinians just teach their kids to keep their voices at a quieter level regardless of where they’re at and to be aware of their surroundings and whether or not it’s a place where they can be loud.